The Coast Guard has fined a Gloucester, Mass., man who was shooting flares even though he was not in distress on July 4, 2010. Coast Guard Station Gloucester was able to identify the man, who was fined 180 dollars when he admitted to wrongfully setting off the flares. The Coast Guard takes false distress calls very seriously and actively pursues those who make them. The person responsible can be ordered to pay restitution to the government in an amount equal to that spent on responding to the hoax, a fine of up to $250,000 and up to 6 years in prison. Hoax distress calls put responding Coast Guard crews in unnecessary danger and divert limited resources from responding to legitimate emergencies. In light of the news report above I want to remind boaters about the rules concerning visual distress signals. All watercraft used on coastal waters, the Great Lakes, territorial seas, and those waters connected directly to them, up to a point where a body of water is less than two miles wide, must be equipped with U.S.Coast Guard approved visual distress signals (VDS). Boats owned in the United States operating on the high seas must be equipped with U.S.Coast Guard approved visual distress signals. Boats participating in organized events such as races, regattas, or marine parades. Open sailboats less than 26 feet in length not equipped with propulsion machinery. U. S. Coast Guard regulations prohibit display of distress signals except when a distress actually exists. You should only use distress signals when help is close enough to see the signal. The U. S. Coast Guard recognizes both pyrotechnic and non-pyrotechnic devices. A minimum of three pyrotechnic devices must be carried. Pyrotechnic VDSs must be U. S. Coast Guard approved, in serviceable condition, and readily accessible. One hand-held red flare and two red meteors (day and night). One hand-held orange smoke signal (day), two floating orange smoke signals (day) and one electric light (night only). Or , if you are within sight of another person, you can signal distress by extending both arms out and raising them up and down. The U. S. Coast Guard recently reported 37 distress calls as thunderstorms raged through Chesapeake Bay. And that’s just in the Bay. Here is a reminder on how to “read” the weather to avoid finding yourself in such a situation. You should not leave the dock without first checking the local weather forecast. You can get weather information from TV, radio, your VHF radio and on the Internet. While on the water, your VHF radio is the best source for weather warnings. Even so, at certain times of the year weather can change rapidly and you should continually keep a “weather eye” out, especially to the west, in order to foresee changes which might be impending. Clouds are a tool you can use to predict or forecast weather. The type of cloud and direction of movement can warn you of weather changes that are imminent. Clouds are categorized by the altitude at which they appear and the shape that they take. This is not an in-depth study of clouds, but an attempt to simplify the subject for use by recreational boaters. Variations of cloud types are created by combining the cloud’s shape/description with the altitudinal names as a prefix or suffix. Cirros (high) or Cirro can be used with cumulus (heap) to indicate a cirrocumulus or high, lumpy cloud. Cirrocumulus clouds, sometime called “mackerel skies”, can indicate the approach of a hurricane in the tropics. It can also be used with stratus (flat, layered) as in cirrostratus to indicate a high, flat or layered cloud. Alto can also be used with cumulus and stratus to indicate altocumulus and altostratus which are middle altitude lumpy clouds and middle altitude layered clouds respectively. Nimbo or nimbus might be used with cumulus or stratus to indicate a cloud formation that is producing precipitation. These clouds could be either cumulonimbus which would be a lumpy, vertically-rising rain cloud or nimbostratus which would be a sheet or flat-looking rain cloud. High clouds exist above 18,000 feet and are cirrus clouds. Cirrus clouds are the most common of the high clouds. They are composed of ice and consist of long, thin, wispy streamers. Cirrus clouds are usually white and predict fair weather. Sometimes called mares tails, they stream with the wind. By watching the movement of cirrus clouds you can tell from which direction weather is approaching. The appearance of cirrus clouds usually indicates that a change in weather will occur within 24 hours. Cirrostratus are sheetlike, thin clouds that usually cover the entire sky. The sun or moon can shine through Cirrostratus clouds. Cirrostratus clouds usually come 12-24 hours before a rain or snow storm. Cirrocumulus are small, rounded puffs that usually appear in long rows. They are usually white, but sometimes appear gray. Cirrocumulus are usually seen in the winter and indicate fair, but cold, weather. In the tropics, they may indicate an approaching hurricane. Medium high clouds occupy altitudes of 6,500 feet to 18,000 feet. These clouds are called alto clouds. Alto clouds are used to predict weather changes in 6 to 12 hours. An Altostratus cloud usually covers the whole sky. The cloud looks gray or blue-gray. The sun or moon may shine through an Altostratus cloud, but will appear hazy. An altostratus cloud usually forms ahead of storms with continuous rain or snow. Altocumulus clouds are grayish-white with one part of the cloud darker than the other. Altocumulus clouds usually form in groups. If you see Altocumulus clouds on a warm, sticky morning, be prepared for thunderstorms by late afternoon. Low clouds, called stratus clouds, are at altitudes up to 6,500 feet. These clouds form a solid sheet or layer of cloud mass. Stratus clouds are uniform gray in color and almost cover the entire sky. Light mist or drizzle is sometimes associated with Stratus clouds. Stratocumulus clouds are low, lumpy and gray. Most form in rows with blue sky visible in between. Precipitation rarely occurs with Stratocumulus clouds, however, in frontal weather they may turn to Nimbostratus. Nimbostratus clouds are dark gray with a ragged base. Rain or snow is associated with Nimbostratus clouds. Vertically developing clouds are the Cumulus type. These small, lumpy clouds are low “fair weather” clouds. However, as they develop vertically (by rising hot air) they may go from small, fair weather clouds to large, boiling, vertically-growing monsters called cumulonimbus. Cumulonimbus are generally known as thunderstorm clouds. High winds will flatten the top of the cloud into an anvil-like shape. Cumulonimbus are associated with heavy rain, snow, hail, lightning, and tornadoes. The anvil usually points in the direction the storm is moving. 2. On the other hand, watch for cumulus (puffy) clouds that start to rapidly develop vertically to become cumulonimbus thunderstorm clouds. On hot and humid days, these storms occur over water as the radiant heat from the land absorbs moisture from nearby water and rises to produce thunderheads. These storms can also indicate a cold front and may be preceded by squall lines, a row of black storm clouds. Wind shifts unpredictably and accelerates dramatically. Lightning can occur for miles in front of a storm and after the storm appears to have passed. Weather changes generally come from the west so scan the sky with your weather eye, especially to the west. A sudden drop in temperature and change in the wind (increasing winds and/or seas) often means that a storm is near. If you have a barometer on your boat check it every two to three hours. A rapid drop in pressure means a storm is approaching. Close all hatches and ports. Head for the nearest shore that is safe to approach and duck into the lee of land. Put the bow into the wind and take waves at about a 40-45 degree angle. Watch for other boats and floating debris. Pump out bilges and keep dry. Change to a full fuel tank. If there is lightning, unplug electrical equipment and keep away from ungrounded metal objects. Secure loose items which could be tossed about. Keep everyone low in the boat and near the centerline. The Coast Guard reminds all divers and the boating community to be safe this lobster mini season, Wednesday and Thursday. The lobster mini season brings with it a significant increase in the number of boaters and divers in Florida’s coastal waters and this increase in boating activity can lead to accidents if boaters and divers forget to practice safety first. The Boating Advisory Trailer – Public Awareness Kit (BAT-PAK) will continue its safety outreach tour throughout the Florida Keys during the last week of July. Check your dive gear before your dive and monitor your air during your dive. Do practice dives before the season starts. Use the preseason time to refresh your skills and improve your fitness. Remember that an underwater hunt is more stressful than a recreational dive. Do not dive outside your physical capabilities. 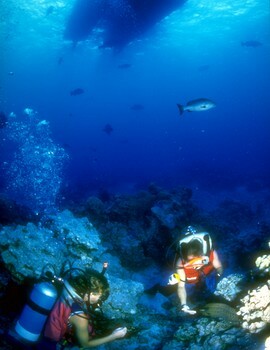 Ensure you have a dive plan and are diving with a buddy. File a float plan with a family member or a nearby marina. Stick to a time frame while diving and let someone know if it changes. Ensure you are wearing reflective material on your dive suit. Mark the area in which you are diving with a dive flag and a light. While piloting a boat, stay aware of your surroundings. Remember divers can get separated from their flags and boats. Remember, taking all the basic safety precautions will facilitate an increased chance of helping or finding a diver in the event Coast Guard assistance is needed. Boats engaged in diving should show a rigid replica of the internationally recognized “Alpha Flag”. This is a blue and white flag with a swallow tail. Additionally, the traditionally used “Divers Down” flag should be flown from the boat or from a float over the divers. This red flag with a diagonal white stripe should be easily seen on the water. Personnel from the Coast Guard, Florida Fish and Wildlife Conservation Commission and other agencies will patrol the waters surrounding South Florida to ensure compliance with federal and state regulations. Prohibitions: Harvest of lobster is prohibited in John Pennekamp Coral Reef State Park during the sport season. Harvest is also prohibited during both the two-day sport season and regular season in Everglades National Park, Dry Tortugas National Park, and no-take areas in the Florida Keys National Marine Sanctuary. Now that tropical storm “Bonnie” has fizzled in the Gulf of Mexico and oil spill recovery operations have resumed after a four day pause, it is not the time to forget about the remainder of hurricane season. Here is a list of the many things to consider before, during and after a hurricane. Some of the safety rules will make things easier for you during a hurricane. All are important and could help save your life and the lives of others. If local authorities recommend evacuation, you should leave! Their advice is based on knowledge of the strength of the storm and its potential for death and destruction. Check your marine insurance carefully to see if you are required to take some action in order to make the claim valid. Check with your marina and find out their policy for handling hurricanes. In some States marinas can order all boats to leave. If you are going to move your boat, determine where ahead of time. Learn the storm surge history and elevation of your area. Learn safe routes inland and make plans of where you will evacuate to. Inventory the property on your boat…with video equipment if possible. Plan what will be removed from the boat and what must stay. Keep all legal documents such as registration, insurance policy, marina rental agreement, radio license etc. in one easily moved, secure container. Make an inventory of documents, photos, and other irreplaceable articles that need to be taken in case of an evacuation. Frequently monitor radio, TV, NOAA Weather Radio, or hurricane Hotline telephone numbers for official bulletins of the storm’s progress. Review needs and working condition of emergency equipment, such as first aid kit, flashlights, battery-powered radios. Move boats on trailers close to house. Weigh them down. Lash securely to trailer and use tie-downs to anchor trailer to ground or house. Let air out of trailer tires. Anchored boats should be tied high, using a half hitch knot (loop knots slip). Anchor rigging should consist of new or good line and chain. Boats docked at marinas should have extra lines attached. Line lengths should be sufficient to take care of excessive high water. Once your boat is secured, leave it and don’t return once the wind and waves are up. Check supplies of special medicines and drugs. Secure lawn furniture and other loose material outdoors. Tape, board, or shutter windows to prevent shattering. Wedge sliding glass doors to prevent their lifting from their tracks. Closely monitor radio, TV, NOAA Weather Radio, or hurricane Hotline telephone numbers for official bulletins. Follow instructions issued by local officials. LEAVE IMMEDIATELY IF ORDERED TO DO SO. Board up garage and porch doors. Move valuables to upper floors. Turn up refrigerator to maximum cold and don’t open unless necessary. Use phone only for emergencies. Stay indoors on the downwind side of the house away from windows. Beware of the eye of the hurricane. Bring in small hand tools to aid you should your home be damaged during the storm. Leave areas which might be affected by storm tide or a stream flooding. Leave early – in daylight if possible. Shut off water and electricity at main stations. Take small valuables and papers, but travel light. Persons needing special foods or medicines should take them with them. Take sufficient money in small bills to defray certain expenses you may incur. Leave food and water for pets (shelters will not take your pets). Notify family members or friends outside of the warned area of your evacuation plans. Drive carefully to designated shelter or other evacuation location using recommended evacuation routes. Stay in your protected area until announcements are made on the radio or TV that the dangerous winds have passed. Drive carefully; watch for dangling electrical wires, undermined roads, and flooded low spots. Report broken or damaged water, sewer, and electrical lines. Use caution re-entering your home. Check food and water for spoilage. If your home has structural damage, do not enter until it is checked by building officials. Feel free to print this out and hang it on your refrigerator as a constent reminder. You can take it down in December. Why Should I Carry One If It Is Not Required? Everyone should by now be familiar with all the USCG equipment required to be on you boat before leaving the dock but is it time to rethink that list and add something? What about an anchor? An anchor is not required to be onboard but every vessel should have one. Even if you are not planning to stop and anchor for lunch, a swim or to fish, you should have an anchor rigged and ready in case of an emergency. Rigged and ready doesn’t mean that it is in a locker or under a seat with a case of soda on top of it. You should be ready to deploy an anchor in a minute or less. I have witnessed many small boats end up on jetties or run aground when they lost power and had no way of controlling the progress of the boat. The first step in anchoring is to select the proper anchor. In spite of claims to the contrary, there is no single anchor design that is best in all conditions. On most pleasure boats, the three anchors you will find most are the fluke or danforth type, the plow and the mushroom anchor. Mushroom anchors do not have the holding power of a fluke or plow anchor and should only be used on small, lighter weight boats. A local marine supply store can help you select the proper anchor for your boat and for the waters in which you will be boating. Anchors also must have something to attach them to the boat. This is called the anchor rode and may consist of line, chain or a combination of both. The whole system of gear including anchor, rode, shackles etc. is called ground tackle. The amount of rode that you have out (scope) when at anchor depends generally on water depth and weather conditions. The deeper the water and the more severe the weather, the more rode you will put out. For recreational boaters, at a minimum you should have out five to eight times (5 to 1 scope for day anchoring and 6 to 8 to 1 for overnight) the depth of the water plus the distance from the water to where the anchor will attach to the bow. For example, if you measure water depth and it shows four feet and it is three feet from the top of the water to your bow cleat, you would multiply seven feet by six to eight to get the amount of rode to put out. Below is a list of steps to anchoring but I should point out first that before you anchor in an emergency make sure you look all around you and make sure there is not a large barge or other vessel bearing down on you. Select an area that offers maximum shelter from wind, current, boat traffic etc. Pick a spot with swinging room in all directions. Should the wind change, your boat will swing bow to the wind or current, whichever is stronger. Determine depth and bottom conditions and calculate the amount of rode you will put out. Never anchor from the stern alone, this could cause the boat to swamp or capsize. Rig the anchor and rode. Check shackles to make sure they are secured with wire tied to prevent the screw shaft from opening. Lay out the amount of rode you will need on deck in such a manner that it will follow the anchor into the water smoothly without tangling. Stop your boat and lower your anchor until it lies on the bottom. This should be done up-wind or up-current from the spot you have selected. Slowly start to motor back, letting out the anchor rode. Backing down slowly will assure that the chain will not foul the anchor and prevent it from digging into the bottom. While reversing on a set anchor, keep a hand on the anchor line. A dragging anchor will telegraph itself as it bumps along the bottom. An anchor that is set will not shake the line. When the anchor is firmly set, look around for reference points in relation to the boat. You can sight over your compass to get the bearing of two different fixed points (house, rock, tower, etc. ) Over the next hour or so, make sure those reference points are in the same place. If not you’re probably dragging anchor. Begin anchor watch. Everyone should check occasionally to make sure you’re not drifting. Retrieve the anchor by pulling or powering forward slowly until the anchor rode hangs vertically at the bow. Cleat the line as the boat moves slowly past the vertical. This will use the weight of the boat to free the anchor and protect you from being dragged over the bow. Once free, raise the anchor to the waterline. Clean if necessary and let the rode dry before stowing away. The last article focused on suddenly finding yourself in charge of a small outboard vessel, but what if the owner/skipper is suddenly injured, becomes ill or falls overboard on an inboard boat or, worse yet, a large inboard twin engine. Once again, you were just along for the ride, you don’t know anything about the boat, about what to do or how to do it – but…suddenly YOU are in charge. Suddenly, YOU need to know how to run the boat, YOU need to know how to use the emergency equipment, YOU need to know what to do in each situation that requires action. Don’t wait until YOU are suddenly in charge, learn the basics before just “going along for the ride”. The basics are the same no matter what size the boat you find yourself on; you need to know the location of the Personal Flotation Devices (PFDs), the fire extinguisher(s), emergency signaling devices and other safety gear. 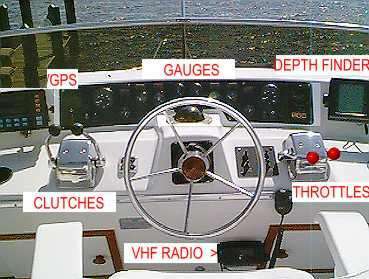 You also need to know how to operate the VHF radio and how to lower the anchor. These two items may be your lifeline to safety. Again, it is a good idea to take a Basic Boating Safety Course even if you don’t own a boat. The more time you take to educate yourself the more likely you will be a hero rather than a hindrance, should an emergency arise. Rather than just sit there in the “co-pilot” seat looking at the sky and the water, look around, ask questions, watch what the owner/skipper does. This article is not intended to make a novice an experienced boat handler but we hope to at least get the inexperienced person to some level of comfort with what he/she sees around them. Note the typical cockpit layout below. You have electronic equipment such as a VHF radio, Depth Finder, GPS. You also have the controls and sensors for operating the boat such as the clutches (which shift gears), the throttles (which control the speed of the engines) and the various gauges which you should monitor as you do in your car. This layout is for a typical twin engine vessel. A single engine will have only one clutch and one throttle. Pay particular attention to the RED knobs on the throttles. They are so marked to make sure that you don’t forget which you are handling. You wouldn’t want to be in a close quarters situation and think you were shifting from reverse to forward while accidentally pushing the throttle forward instead of the clutch. Safety Hint: When using the clutches, if there are two, keep both hands on them. This will help prevent you from accidently hitting the throttle. If there is only one clutch, put one hand on it and the other behind your back. The throttles on a boat act like the accelerator on your car with one exception; You shouldn’t operate them with your feet. The throttles, usually marked with red knobs, are at idle when they are pulled all the way back toward you. As you move them forward, the fuel supply to the engine(s) is increased and, assuming you are in gear, you move faster. The clutches, with the black knobs, act like your gear shift. When the lever is standing straight up in the middle you are in neutral. When you push the lever forward you are engaging the forward gear and when you pull the lever back you are engaging the reverse gear. Important: Never change gears without first pulling the throttles to idle speed (neutral)! The vessel on which you find yourself suddenly in charge may or may not have an anchor windlass (assists in raising and lowering the anchor by electric motor). If it does not, then the anchoring is fairly straightforward as outlined in the Nautical Know How Basic Boating Course STEPS TO SMOOTH ANCHORING. However, if you find yourself on a vessel with an anchor windlass the steps are the same, just the release and retrieval of the anchor are different. 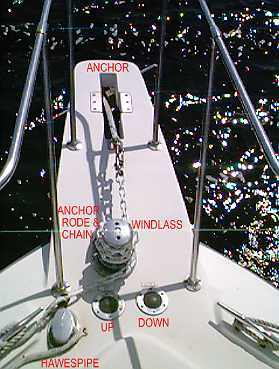 The picture at left is a typical small boat (38′) electric anchor windlass. The first step in operating such a system is to make sure that you have power to the windlass.Normally, when underway the main breaker to the windlass will be turned on but there is usually a switch in the cockpit which disables the power temporarily. This is so that you don’t accidentally step on the up and down switches on the deck while underway or while handling lines on the bow. Make sure that the cockpit switch is on. Notice that the anchor rode (chain/line that attaches the anchor to the boat) is cleated off on the port side to secure the anchor up and that the remainder of the rode leads through the “hawspipe” (to the left of the “UP” switch) into the anchor locker. The first step to lowering the anchor is to remove the cap from the hawespipe. As a rule of thumb, you want to put out anchor rode which is 7 to 10 times the water depth. Pull enough anchor rode out of the locker and lay it out neatly up and down the deck. Next, uncleat the anchor rode on the port cleat which was holding the anchor securely and recleat the rode at the maximum amount of scope you expect to let out. Make sure the boat is completely stopped and, once the rode is cleated, you simply step on the down button and the windlass will lower the anchor. Make sure that you keep your hands and feet clear so you don’t get tangled in the anchor rode and get pulled off the vessel. The vessel’s VHF radio is fairly simple to operate and if the owner/skipper was operating legally, it should already be tuned to channel 16 which is the hailing and distress frequency. For more information on VHF radio procedures look at Marine Radio Procedures in the Nautical Know How Tips Archive. In order to call for assistance, hold down the “transmit” button on the side of the microphone and speak directly into the mike. Once you have delivered your message, release the button and wait for a response. Let’s explore two different scenarios in which you might find yourself. Whether you are in a single engine or twin engine boat really doesn’t matter. As was mentioned above, we aren’t going to make you boathandlers, just emergency situation solvers. You have just left the marina and are heading out for a day of coastal cruising. The owner is operating the boat through the well marked channel and has explained to you that it is important to keep within the channel which has sufficient depth to safely operate. He/she has shown you how to read the depth finder and you find that the channel has a consistent depth of 8 feet. Suddenly the owner, who doesn’t look so good all of a sudden, collapses and falls out of the chair behind the wheel. What should you do? Your first reaction should be to try and get the owner, now victim, to acknowledge his or her situation. Ask if they are okay. Even if they are unconscious and not breathing, there is nothing you can do until you have control of the boat. You should first take off all power and shift to neutral. While the boat coasts to a stop try to steer toward the edge of the channel. Assuming you are not in immediate danger of drifting out of the channel or running into another vessel, check the condition of the victim again. Let’s assume they have simply fainted and are still breathing and have a pulse. Attempt to contact the marina that you just left via VHF radio and advise them of the situation. Explain that you are not experienced and that you need immediate assistance. Give them your location by noting the latitude and longitude on your GPS or simply note the channel marker number that you might be closest to. Depending on your comfort level in actually operating the vessel, you should either consider anchoring, tending to the victim and waiting for help or putting the vessel in forward and turning the vessel to return to the marina. If you chose the latter, do so under control. You don’t necessarily need to go at full idle but don’t overdo the speed. Remember, boats don’t have brakes and you can only stop them by running into something, running aground, coasting to a stop in neutral, or shifting to reverse at full idle. You are offshore, within sight of land, and headed for a favorite fishing spot that the owner has programmed into the GPS. In this case the owner is a he and he tells you to take the wheel while he goes to relieve himself. No problem, anyone can steer a boat- so you settle in as commanded. The water is not too rough but an occasional wave that is considerably bigger than the rest comes along and tosses the boat slightly. Suddenly you hear a scream and a splash and look aft to find that the owner was thrown overboard off the stern by that last unexpected wave. What should you do? You should first pull the throttles to idle and simultaneously shift the clutches to neutral. Immediately throw the Type IV throwable device in the direction of the victim in the water. Try to keep focused on the individual in the water. Don’t lose sight of him. Once you have something that floats in the water in the vicinity of the victim it is time to attempt the rescue. After making sure the victim is clear of the props, shift the clutch(s) into forward and at idle speed make a U-turn and head back toward the victim in the water. Make sure to turn the bow toward a person in the water, swinging the stern (and props) away from them. Since he is conscious and can swim, don’t get too close. Approach from downwind so that he floats down to you, not the boat floating down on the victim. Be sure to shift to neutral well before approaching the victim and coast to a stop short of him. From here, try to throw a line and a PFD to the victim in the water. Once you have him attached to the boat, do not use the clutches. The two scenarios above were dangerous but obviously could have been much worse. For instance, what if the person in the first scenario wasn’t breathing and didn’t have a pulse and what if you didn’t notice the person in the second scenario go overboard? What would you do then? Give it some thought, it could happen.